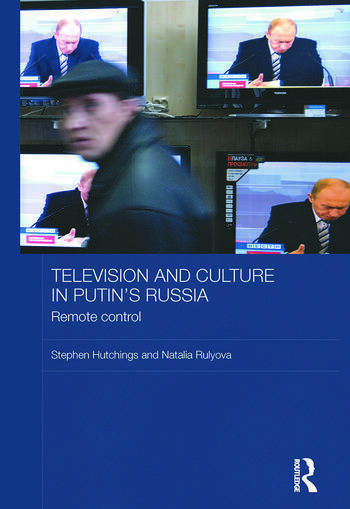 This book examines television culture in Russia under the government of Vladimir Putin. In recent years, the growing influx into Russian television of globally mediated genres and formats has coincided with a decline in media freedom and a ratcheting up of government control over the content style of television programmes. All three national channels (First, Russia, NTV) have fallen victim to Putin’s power-obsessed regime. Journalists critical of his Chechnya policy have been subject to harassment and arrest; programmes courting political controversy, such as Savik Shuster’s Freedom of Speech (Svoboda slova) have been taken off the air; coverage of national holidays like Victory Day has witnessed a return of Soviet-style bombast; and reporting on crises, such as the Beslan tragedy, is severely curtailed. The book demonstrates how broadcasters have been enlisted in support of a transparent effort to install a latter-day version of imperial pride in Russian military achievements at the centre of a national identity project over which, from the depths of the Kremlin, Putin’s government exerts a form of remote control. However, central to the book's argument is the notion that because of the changes wrought upon Russian society after 1985, a blanket return to the totalitarianism of the Soviet media has, notwithstanding the tenor of much western reporting on the issue, not occurred. Despite the fact that television is nominally under state control, that control remains remote and less than wholly effective, as amply demonstrated in the audience research conducted for the book, and in analysis of contradictions at the textual level. Overall, this book provides a fascinating account of the role of television under President Putin, and will be of interest to all those wishing to understand contemporary Russian society. Introduction. Chapter 1. ‘(Dis)informing Russia: Media Space and Discourse Conflict in Post-Soviet Russian Television News’. Chapter 2. ‘St Petersburg 300: Television and the Invention of a Post-Soviet Russian (Media) Tradition’. Chapter 3. ‘Russia's 9/11: Performativity and Discursive Instability in Television Coverage of the Beslan Atrocity’. Chapter 4. ‘Promiscuous Words: The Post-Soviet Tok-shou as Cultural Mediator and Hegemonic Pressure Point’. Chapter 5. ‘Unfulfilled Orders: Failed Hegemony in Russia’s (Pseudo) Military Drama Serials’. Chapter 6. ‘Laughter at the Threshold: My Fair Nanny, Television Sitcoms and the Post-Soviet Struggle Over Taste’. Chapter 7. ‘(Mis)appropriating the Western Game Show: Pole Chudes [The Field of Miracles] and the Double-edged Myth of the Narod’. Chapter 8. ‘Russian Regional Television: At the Crossroads of the Global, the National and the Local’. Chapter 9. ‘Television through the Lens of the Post-Soviet Viewer’. Conclusion. Bibliography. Stephen Hutchings is Chair in Russian Studies in the Department of Russian Studies, University of Manchester, UK. He is the author of Russian Literary Culture in the Camera Age: The World as Image (2004), and co-editor of Soviet and Post-Soviet Screen Adaptations of Literature: Screening the World (co-edited with Anat Vernistki, 2004), both published by Routledge. Natalia Rulyova is Lecturer in Russian at the Centre for Russian and East European Studies, University of Birmingham, UK.